This is a fabulous recipe sent to me by my sister as a nutritious alternative to white rice. I love cauliflower so this was right up my alley! Don't let the name fool you...the texture is like rice but the taste is still cauliflower. Yet the taste is mild enough so it would work as a perfect substitution for white rice. It can be eaten as a side alone or as a base for dishes like stir-fries or curries. 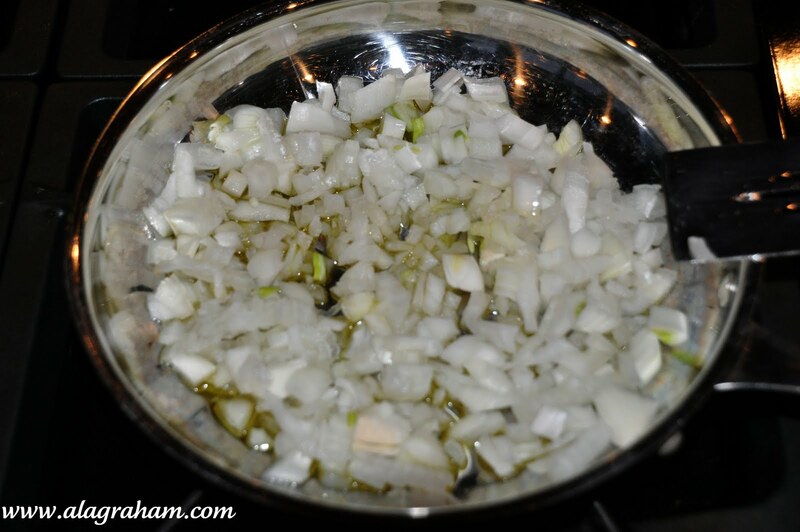 I added onion because I was eating it as a side and wanted a little more flavor but you can easily skip the onion and just saute the cauliflower in the oil for it to be used as a mild base for other dishes. Add oil to a large saute pan, add the onion and saute until slightly browned, about 10 minutes. Meanwhile, clean the cauliflower. Remove the leaves and most of the core. 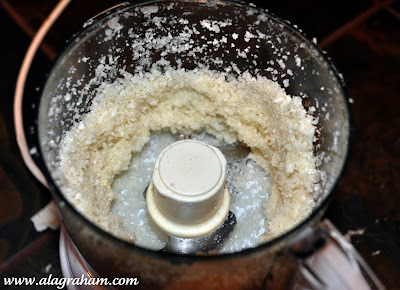 Chop it into medium pieces and process in a food processor until it is the size of rice or couscous, either using a plain steel blade or a shredder blade. Alternatively, you can shred it with a hand-held grater, or even a knife. The key is to make it fine. 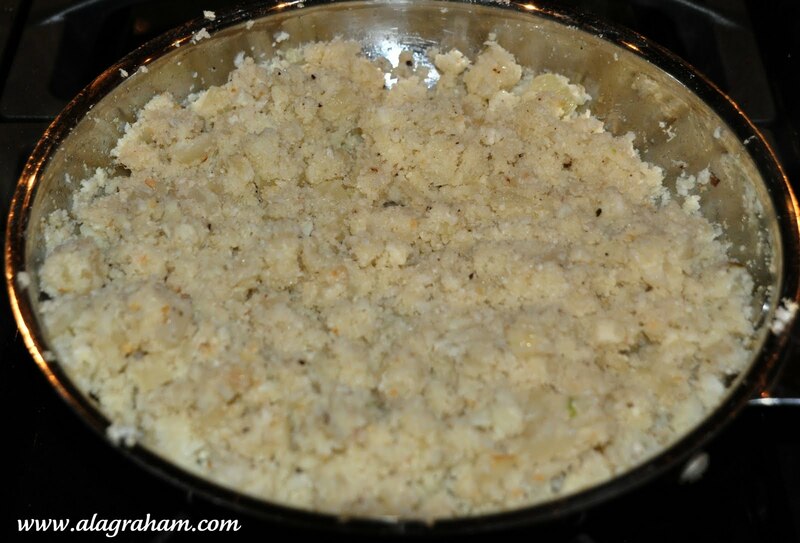 Once the onion is browned add the cauliflower and the garlic flakes. Season liberally with salt and pepper. Cook for approximately 5 minutes. If garlic isn't your thing, try a seasoning you like best: ginger, paprika, curry or red pepper. Taste along the way. I garnished with a little green onion...delicious! WOW! What an amazing idea!. This has been bookmarked! That's such a great idea!! I really enjoy cauliflower and wouldn't mind the cauliflower taste at all, and Yes, I would add the onions too! This one's going to my list.It's a shame cauliflowers are so expensive and not very easy to find here in Korea. But I will certainly make it when I go to Brazil. Renata, First off I did not know you were in Korea, I thought you were always in Brazil! I have not tried it yet, but I have heard that you can use frozen cauliflower just the same, assuming you have better access to frozen cauliflower. I read on other recipes that you can microwave it for about 3-5 minutes and then go onto the food processing step. Once I try it I will let you know exact times. What a wonderful and healthy idea. 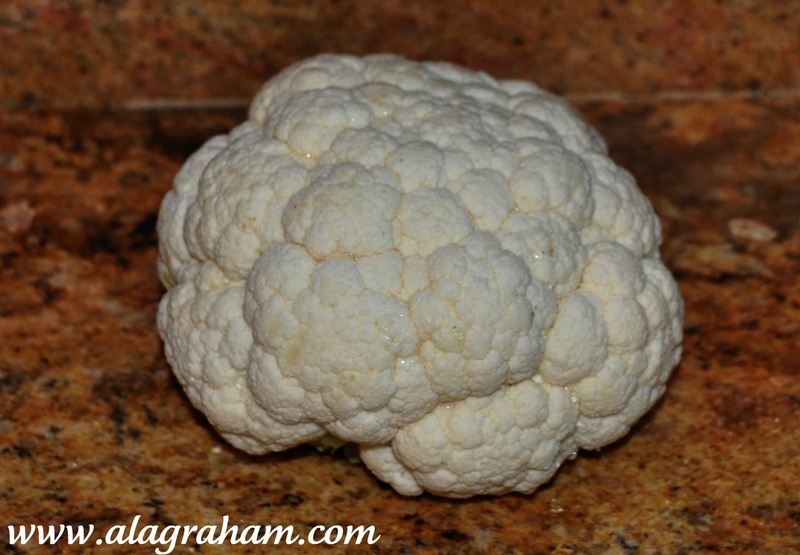 I love cauliflower as well so I will be trying this. I bet it doesn't weight you down as much as rice can sometimes and I would love that aspect as well. This looks delicious. 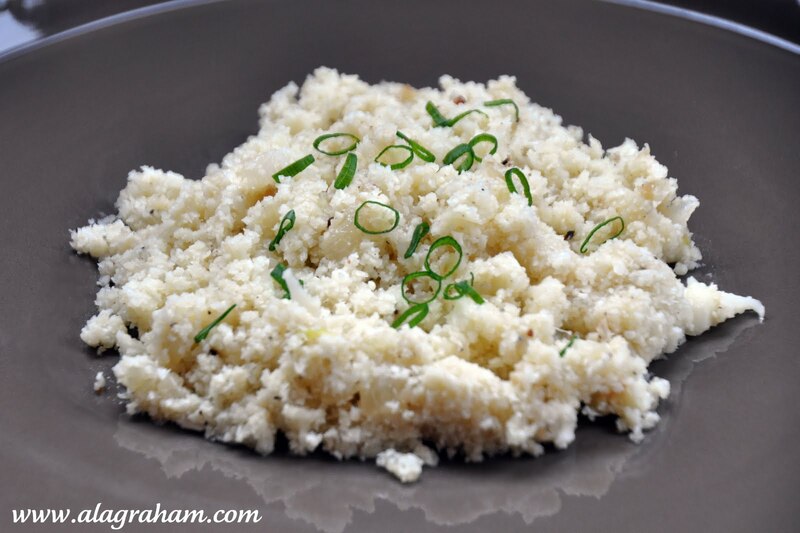 Really a good and healty recipe and I like cauliflower! I wan to try it....thanks for sharing! Excelente receta muy original,lindo color ,se ve sabrosa,abrazos. Well what do you now...I am in a hurry to make this with a bean dish...very nice and thank your sister for me. This is a brilliant idea and one that I will have to try. Very fun! !